We start off light as this work did not really do much than provoke a storm of positivity..
Marcus Harvey now produces paintings and sculptures such as, The Lord High Admiral 2008, which is a bronze sculpture of Winston Churchill, with what looks like moppy Mohican haircut. In Clown With Skull 2012 Harvey painted a clown and skull viewed through frosted glass. You can find more info and pictures of his works on the Artnet page. Made by Paul McCarthy (born 1945) Tree was a 79ft (24 metre high) Inflatable sculpture. It was installed outside the Place Vendome in Paris October 2014. Officially it was described as a Christmas Tree however, it had a very distinct appearance of a Buttplug. It provoked such a reaction from some members of the public that the artist was actually accosted by a man, whilst he was completing the installation of the sculpture. The sculpture also had its cords cut by another protestor, causing the inflatable to deflate. One shop owner mentioned that sales of Buttplugs increased nearly 2000% since the installation of the sculpture. 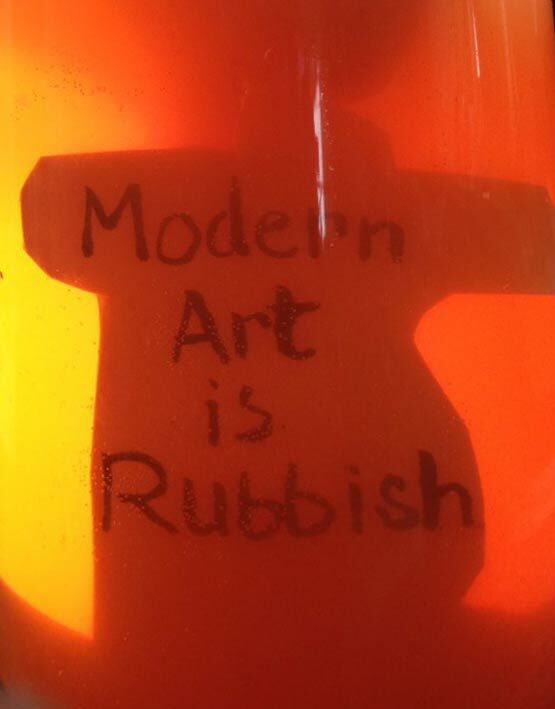 “People may be offended if they want to refer to [it as a] plug, but, for me, it is more of an abstraction.” Mcarthy was quoted as saying in an Artnet news article. Paul Mccarthy as well as sculpture, has produced video works, he has used his body as a paintbrush, as a canvas and has used his bodily fluids or food in his works. He makes a lot of references to Disney and other American topics in his work. He is very anti-mass media and consumer culture. Here is a preview of one of his video works called Painter. 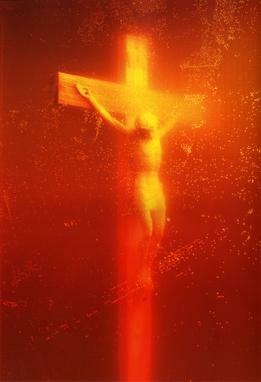 Immersion Was a piece created by Andres Serrano, it is a large photograph, showing crucifix plunged into a vat of the artist’s urine, it is very orange and yellow in hue… The artist had no real idea as to what the piece was about when he took the picture. It should be noted that he identifies as a Christian. When it was shown in Avignon in France 2011 the photo was totally destroyed by being slashed with a knife, and it was also vandalised when exibited in Australia. Serrano has received death threats and hate mail. He has received money from a state-funded art council which caused further controversy. The piece is a reflection on the commercialisation of Jesus and commodifying of him, This a view sister Wendy herself expressed in the video below. Other Andreas Serrano works range from killer clowns to burn victims and bodies in a morgue. Created by the Artist Richard Serra, Tilted Arc is a wall of steel (12 feet high and 120 feet long) it curves in a subtle arc over its whole length it is leaning slightly forward. It was commissioned by United States General Services Administration, and was installed on a plaza outside a federal government building. Some office workers disliked the work so much, that they raised a petition with over 1300 signatures to get rid of the sculpture. The General services Administration argued that it was a small percentage of the staff that were complaining , so nothing was done in response. In 1984 a new head was appointed as a regional administrator, William Diamond, he was very anti the work, he suggested the site-specific work could be moved. Diamond arranged for a short public hearing. Richard Serra spoke ou,t saying that the work was site-specific so could not be moved elsewhere. About 120 people spoke in favour of retaining the piece and 58 came forward against it. The panel ruled that the work should be moved, Even though 4000 people also signed a petition to keep it. Richard Serra later sued the GSA as he was promised it would a be permanent work, but the court ruled in the GSA’s favour, stating that, as the GSA owned they work they could do whatever they wanted with it. Below is a video that shows the trial relating to the Serra Trial.